10 Movies Like Venom That Are Positively Villainous! Looking for more movies like Venom that are positively villainous? Whether you love a good “bad guy” origin story or just adore a hero with a few issues, we’ve got you covered! 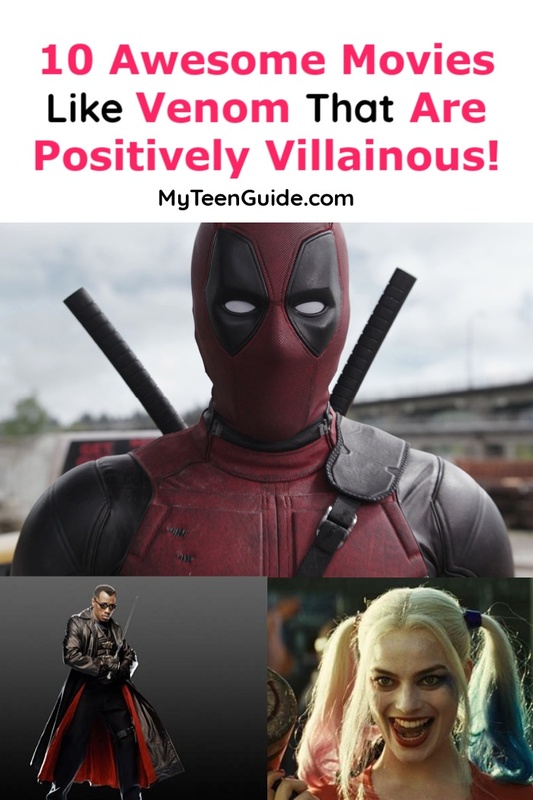 While not all of these movies are strictly about villains, they all have something in common: flawed main characters! Read on to find out which movies I’m watching until Venom releases on October 5th! In case you didn’t know, Venom is an upcoming movie that seems to have a little something for everyone- action, horror, sci-fi and superhero. The movie is based on the character, Venom, from Marvel Comics and stars Tom Hardy, Michelle Williams, Riz Ahmed and Jenny Slate. Until you’re waiting for its October 5, 2018 release in movie theaters, here are some other similar movies to keep you occupied in the meantime. Blade: Trinity is a 2004 action, adventure, horror, superhero movie that is based on the Blade character from Marvel Comics. It is the sequel to the 1998- Blade and the 2002- Blade II . Blade (Wesley Snipes) is wanted by the FBI and finds himself teaming up with the Nightstalkers, a group of vampire hunters, to challenge his arch enemy Dracula (Dominic Purcell). Blade is a half-vampire “Daywalker,” and he’s immune to the bite of other vamps, making him the perfect hunter. Apparently, it also makes him a bit cocky. His hunting also borders on obsession. While he’s not exactly a charismatic hero, you kind of have to feel for a guy who hates half of who he is. It has to be psychologically torturous! This one didn’t do as well as the first movie in the trilogy, earning a slightly above average 59./10 on IMDB. Hellboy is a 2004 action, fantasy, horror, superhero movie that is loosely based on the 1994 comic book- Hellboy: Seed of Destruction – from Dark Horse Comics. It is the prequel to the 2008- Hellboy II: The Golden Army . Hellboy (Ron Perlman) is a demon-turned-superhero who works to defend the world’s paranormal threats. Like Blade, Hellboy denies part of who he is. Unlike Blade, though, he’s actually a pretty likely guy, once you get past the attitude. This one scored a 6.9/10 on IMDB, and did even better over at Rotten Tomatoes with an 81%. Ghost Rider is a 2007 action, adventure, fantasy, superhero movie that is based on the Ghost Rider character from Marvel Comics. It is the prequel to the 2012- Ghost Rider: Spirit of Vengeance. Johnny Blaze (Nicolas Cage), a stunt motorcycle rider who sells his soul to the devil and is transformed into the Ghost Rider, a supernatural vigilante who hunts demonic souls, so that he can defeat Blackheart (Wes Bentley), the devil’s son. While I thought the movie’s premise was intriguing, critics didn’t really agree. It managed an average score of 5.2 on IMDB, but Rotten Tomatoes really hated it. They only gave it a 26%! Hancock is a 2008 action, adventure, drama, superhero movie. John Hancock (Will Smith), a careless alcoholic superhero; his reckless actions often cause millions of dollars in damages. When Hancock rescues Ray Embrey (Jason Bateman), a PR Specialist, from being struck by a train, Embrey offers to help Hancock repair his damaged public image. To understand how The Terminator ends up on a list of movies like Venom, you really have to watch both of the first two movies. In the first movie, Arnold Schwarzenegger plays an evil cyborg bent on killing Sarah Connor (Linda Hamilton) so that she can’t have the baby that will save humans from AI in the future. In the second movie, though, he’s actually the good cyborg. The evil one is played by Robert Patrick (who recently starred in one of my favorite shows, Scorpion. Alas, it was canned after last season.). So basically, it’s kind of like a story of redemption for the hyped up robot! Both movies did well with critics, scoring above 80%. The first movie earned a rare 100% on Rotten Tomatoes! Green Lantern is a 2011 action, adventure, sci-fi, superhero movie that is based on the Green Lantern character from DC Comics. Hal Jordan (Ryan Reynolds), a careless test pilot, is chosen as the first human member of the Green Lantern Corps, an intergalactic police force. Jordan is bestowed with an alien ring that gives him superpowers and is later tasked with confronting Parallax (Clancy Brown- voice), a supervillain who is determined to upset the universe’s balance of power. Apparently, Ryan Reynolds just excels at playing flawed superheroes! You’ll see him again on this list! Of all the movies like Venom with flawed heroes, Suicide Squad definitely has characters that fit the criteria like no others! Suicide Squad is a 2016 action, adventure, fantasy, superhero movie that’s based on the supervillain team- Suicide Squad- from DC Comics. Amanda Waller (Viola Davis), an Intelligence Officer with a secret government agency, forms a task force consisting of imprisoned, dangerous, criminal supervillains, tasked with saving the world from a menacing threat. The task force consists of Captain Boomerang (Jai Courtney), Deadshot (Will Smith), El Diablo (Jay Hernandez) and Harley Quinn (Margot Robbie). IMDB users thought it was slightly above average, giving it a total of 6.1/10. Rotten Tomatoes wasn’t so kind, scoring it a measly 27%. Personally, I really liked it! If we’re just talking about superhero movies & super-villians, Silence of the Lambs doesn’t really fit, right? However, if we’re talking about flawed yet somewhat heroic main characters, it’s easy to see why this works. Silence of the Lambs is about a young FBI agent, Clarise (Jodi Foster) who is trying to solve a serial killer case. The problem? She’s stuck and needs Hannibal Lector (Anthony Hopkins) to help her out? The bigger problem? His nickname is Hannibal the Cannibal. Can you see where that would be an issue? Lector and Clarise form a strange sort of bond. I wouldn’t call it a friendship by a long shot. Maybe “mutual respect” is a good term, although even that is pushing it. You just have to watch it to understand. Silence of the Lambs scored an 95% on Rotten Tomatoes and an 8.6/10 on IMDB. Like Terminator, you kind of have to watch multiple movies to understand how this franchise fits into movies like Venom. It really is a story of how one guy turned so, so bad…and how he eventually redeemed himself. Starting with Episode I: The Phantom Menace, we learn about Anakin’s early life and his journey to becoming a Jedi. Episode II (Attack of the Clones) continues his origin story and shows how he fell in love with Padme, the Queen. Once we get to the third episode, Revenge of the Sith, we start to see how Anakin becomes Darth Vader. Jump ahead many years, and now we have Anakin as the ultimate bad guy…right up until Episode 6: Return of the Jedi. Ratings range from about a 60% all the way up the high 90s. As far as flawed superheroes go, you can’t really get more messed up than Deadpool! The foul-mouthed, sarcastic hero is on a mission to protect a young boy with new powers, and he’s taking no prisoners. Deadpool stars Ryan Reynolds (Wade Wilson/Deadpool), Josh Brolin (Cable), and Morena Baccarin (Vanessa). Wilson/Deadpool assembles a team of fellow rogue mutants to help him protect the boy. Deadpool 2 scored an 8/10 and an 83% on IMDB and RT respectively. These are just a few great movies like Venom, and if you’re willing to expand beyond the superhero genre, you have even more choices! Flawed heroes come in all forms, and they’re popular for a reason: none of us are perfect, and we can see more pieces of ourselves in a foul-mouthed, sarcastic hero or a guy who’s just looking to make things right than we can in heroes who are perfect from the get-go. Do you have any other favorite movies like Venom? Share below!